I keep seeing this 3D Fiber Lashes mascara, ALL over the internet. In blogs, on instagram, on Facebook, seriously everywhere. One of my friends actually just recently started selling it. To be honest, I wasn't a huge fan when I first saw it because almost all of the pictures I saw, the girls eyelashes were clumped together, and looked like spider legs. I know some people like that look, but I am not one of them. A few weeks ago we set up an online party for me, because she wanted to get the word out. Nobody purchased, but I figured it didn't hurt to try. Then last week my Mom's friend was asking me if she could still order those 3D lashes, so we set up another ONLINE party, and I'm helping my friend out again. This time I decided I had to try this out for myself. 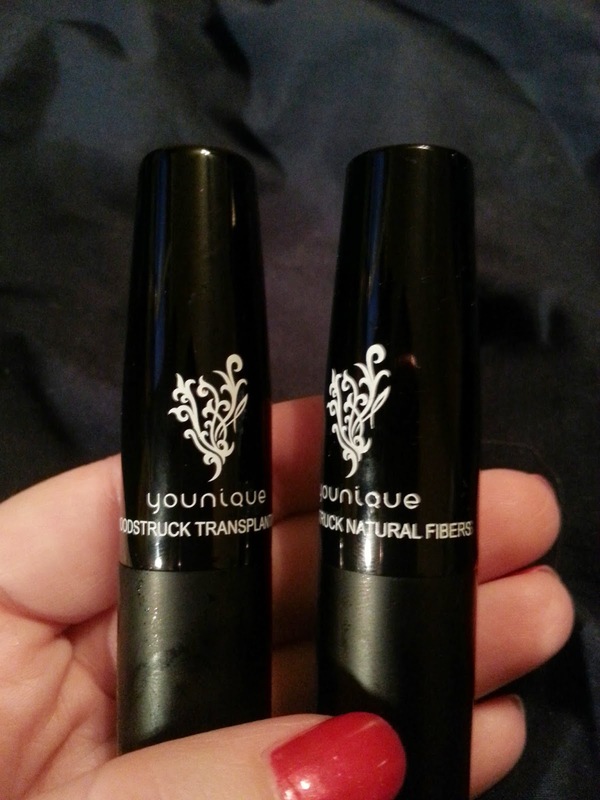 I still see this product everywhere online, and I figured maybe I could apply it to my lashes better. Plus, Younique has a 14 day full refund (minus S&H) policy. My order came in today, and I couldn't wait. I opened it right away because I just had to try it. 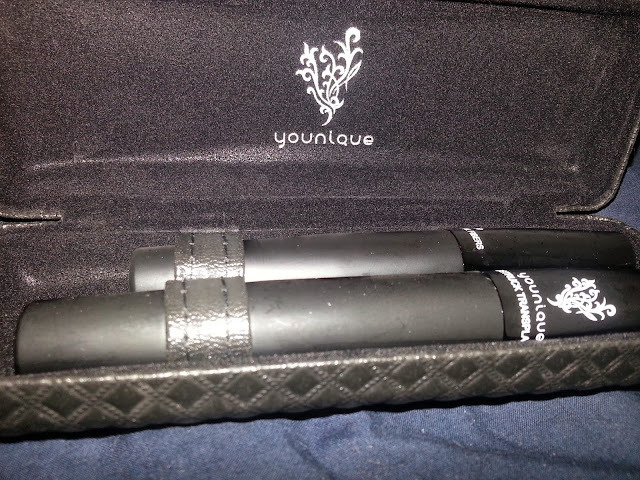 The "mascara" comes in a hard case, that looks like an eye glasses case. Inside you get two tubes. The longer one is the Moodstruck Transplanting Gel, and the smaller one is the Black Natural Fibers. You also get a little instruction pamphlet that tells you how to apply the two. The first step is optional. You can apply your favourite mascara first, then after it dries, apply the transplanting gel, then while that is still wet apply the fibers to the tips of your lashes. Then you apply another coat of the transplanting gel. You have to do this quickly to seal in the fibers. 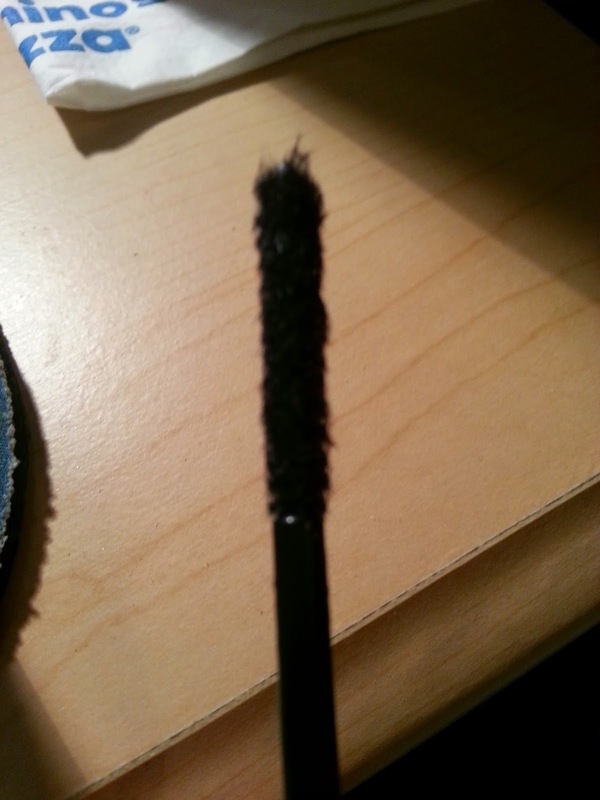 The other method, you don't have to apply your favourite mascara at all. You just apply the transplanting gel, fibers, then gel again. So for my right eye, I ended up applying my own mascara first, just to see what it would be like. Ignore the lack of makeup - I just got out of the shower when the FedEx guy came to the door lol. 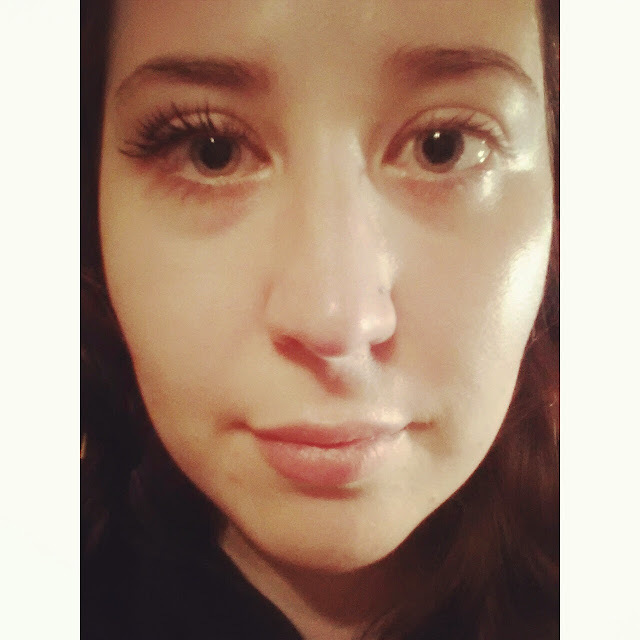 Anyway, this is with one coat of Revlon Grow Lucious Mascara, and then one coat of the 3D Fiber Lashes. Now, I naturally have long lashes, but they are kind of thin. As soon as I applied this... I was shocked. I didn't think it would do much for me - but LOOK at the length. I went on and applied the 3D Fiber Lashes to my left eye. 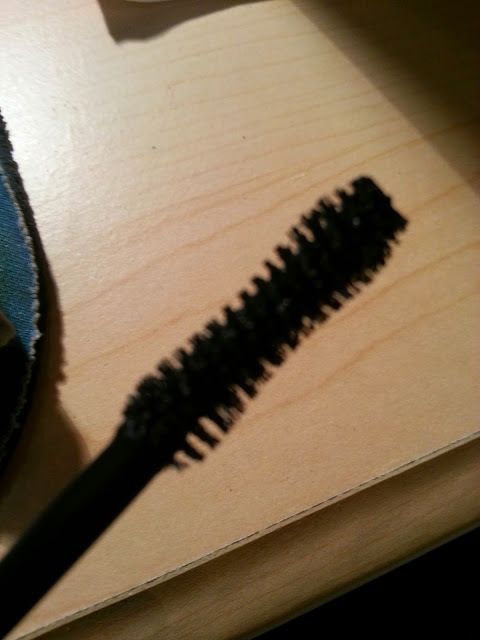 I think it is somewhat noticable that I didn't apply my normal mascara first. I wanted to see if it made a difference, and I think it does. 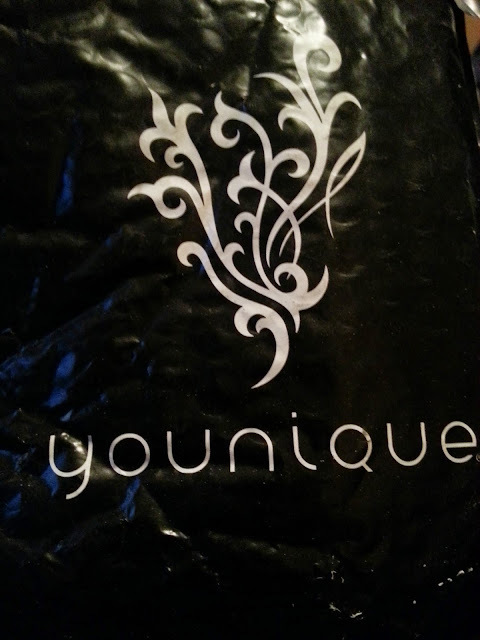 I am honestly shocked at how well this product works. I've never tried Fiber lashes before. 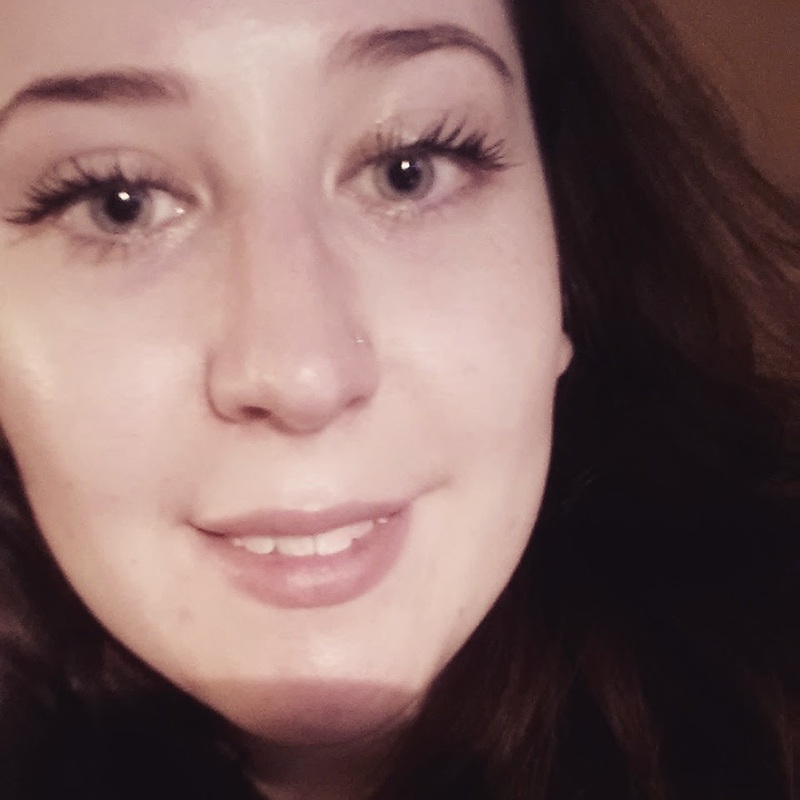 My only complaint is that my lashes got stuck together and did look a little more clumpy then I would like. But I think with some research and practice, it could be avoided.